We’ve met Wendy Bernard before, we’ve recently been working together on the first Yarn Thing Crochet OR Knit-a-long, sharing the experience of learning methods of Entrelac! Wendy has a new book coming out (her fourth! ), it’s a stitch dictionary published by STC Craft, called UP, DOWN, ALL AROUND due out May 20th, spiral bound and 150 patterns worked from top-down, bottom-up, in the round… She wanted a book for herself that gave methods of maintaining stitch patterns no matter the way they were worked and presented that idea to a publisher. Each pattern has four different alliterations that can be incorporated into the design of your work. The book is organized by categories, lace, cables, color-work, etc. and are color coded, and includes charts. Wendy made all of the swatches pictured, using one brand – Blue Sky Alpaca – for the wide range of colors and the visibility of the swatch. Wendy had been teaching at a shop close to home and has had trouble filling the class on the Importance of Swatches. It’s hard for her to understand this because she loves swatching. So, she was perfect for this project and it was the perfect project for her! She wants to investigate, not just how it works up, but also how the yarn reacts after being washed. Marly asked if she had fun creating the book, which seemed to surprise Wendy. She says it can be lonely work, which can be ‘not so fun’, but once it’s done, she likes to look at it and say, I did that, which means she did enjoy it! We are all excited that the book is spiral bound, so it lays flat while you work from it. There was much admiration on air and in the live chat room for the projects we can see in the book, a beautiful blue raglan pullover with lace front, a vest with a cable in the center front. Marly and Wendy shared favorite stitches: Marly shared what she loves is the Waffle Stitch in her crochet. Wendy, in creating this book, spent a lot of time with stitches that were a challenge to convert and, in fact, one could not be converted. So, she showed appreciation for Tech Editors, and the brain twisters! She hopes that the book will empower more knitters with the ability to spend less time figuring out how a stitch needs to be worked, the ability to add a texture to a simple pattern ‘recipe’. 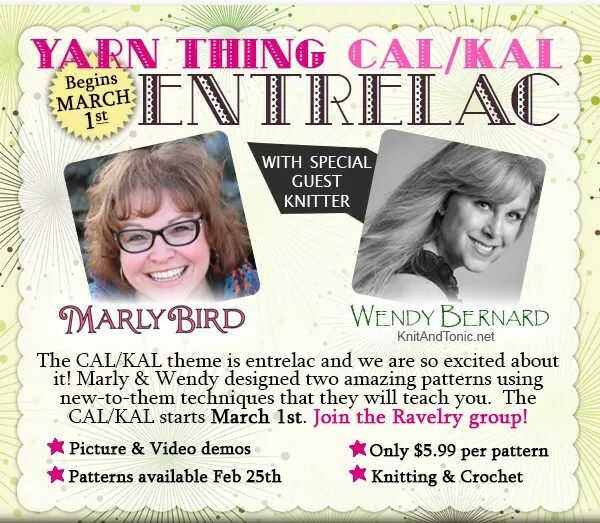 Marly and Wendy also commented on the Yarn Thing CAL/KAL, Marly’s crocheted wrap and Wendy’s knitted cape, both creating the interesting woven look of entrelac but with widely different methods. Make sure if you want to do either of these, read through the threads. There is lots of helpful information from the designers as well as those working on the projects. Wendy and Marly will be selecting winners and it will be posted in the Ravelry group soon! Enjoyed listening to your podcast on Tuesday. This book sounds like an impressive bit of work. I certainly understand the importance of doing a swatch, but I don’t really enjoy the process. I would love taking Wendy’s swatching class. Although I am a process knitter and I do swatch, I probably don’t spend enough time doing it to benefit from the process. Another great interview and I am so curious to see Wendy’s new book. It sounds fabulous and a classic in the making. I’m wondering if designers like to swatch, because that’s part of the design process. You’re playing with the yarn, seeing what works, it’s the fun of designing. Whereas when I pick up a pattern I want to start the project! Not take a detour and make a swatch. In my defense, I usually make things like scarves and blankets, and gauge doesn’t matter as much. If I ever make the leap into garments, I’m gonna have to swatch. That’s amazing the number of swatches you did for the book. Making a decent size swatch is something I learned the hard way. If I had done that for my first sweater, things would have gone much better. Substituting Noro yarn for Brooklyn Tweed is not a great idea. A swatch would have pointed that out. Swatch It! I too am guilty of not doing full swatches then I wonder why garments don’t fit properly…duh! The book sounds super interesting and I’d love a copy!! Swatch it or watch it backfire. Love the concept of Wendy’s new book. Mazel tov! I fail to swatch all the time and I know that I should. I am sure that it will get me at some point. Wendy Bernard’s book sounds really great and so useful. Thanks for the wonderful interview. This episode was so enjoyable, I promise, from now on, I will swatch! Wendy is my favorite designer. I have all of her books and love her approach to knitting. And Wendy is right; a knitter just “has to swatch. Now a days, I force myself to swatch even though I can’t wait to get started. Love the idea behind this book. I don’t know how many times I have tried changing a stitch pattern from flat to round with no success. Must be they way my brain is wired, My last swatch told me two things, I did not like the stitch pattern but I did like the yarn. I would love to sit down and start swatching right away! I am a more experience crocheter then knitter so this book will be a true adventure. And find the perfect design. I try to do some sort of swatch, even when just knitting a hat or mitts. I didn’t do that when I knit my first socks— a bad mistake. I’d love that book! Swatching is never fun but oh so necessary! You’ve gotta swatch! It gives a great opportunity to find out how the yarn is going to react and to try the stitch pattern. I’d love to have the book! I’m just getting into designing and this sounds like a great reference book! Wendy’s book sounds perfect! I can learn some new stitches & select a pattern to create! I might even get motivated to swatch! The most tedious part of the project is the swatch. Anything that makes this more interesting is valuable. Looking forward to perusing Wendy’s book. I don’t mind doing a swatch. I just wish someone had told me to wash them before starting your project. The first sweater I made was for my husband. It fit perfectly before I tried to block it. Now he would have to grow 5 inches before it would fit him. Loved the interview, and the book sounds wonderful! I just finished knitting a nice big swatch for a cardigan I’m planning. It’s been soaked and is blocking now. Knitting a swatch has saved me from a lot of grief when knitting sweaters. I loved the interview and can’t wait to buy the book and knit up a few swatch(es). Thank you for all your hard work, Wendy! Loved the podcast. Just learning the importance of doing a swatch! Honestly I ‘forget’ to make a swatch before starting projects. This books sounds really interesting and I am even excited about swatching to see the different patterns. Thanks for another great show! I have Wendy’s first “top down” book and am now eager to start a swatch for one of her patterns. Great interview and the new book sounds like a good reference. I love stitch dictionarys and swatching to try out all the patterns. Very interesting listening to her talk about getting her brain around reworking lace patterns. Thanks for a great podcast! This is an awesome concept for a book – amazing! I have to say I really enjoy the process of making a swatch and exploring the stitches and yarn before diving in on a project. And Marly’s story about showing her book to her family made me laugh out loud!